One of the few most disappointing sitings on tomatoes is the tomato worm. While Basil, Borage, Bee Balm, Marigold are all beneficial to the deterrence of the worm, they are long term deterrents. They are fragrant and companions to tomatoes. Fill your tomato areas with the complimentary and natural insecticidal plants. 1. Inspect your every morning and evening for worms. They like tender leaves and the bore into the tomato at the stem. Pick them off immediately, then squash them, feed them to the chickens or, drown them in hot soapy water. If there is one, then there are more. 2. Spread diatomaceous earth around the base of your plants and on the actual plants. When it rains you may need to reapply. Be careful not to breathe it in and wear a mask if you aren't in an open area. It is like a powder and breathing any solid particles into your lungs should always be avoided. Make sure not to use pool grade or diatomaceous earth with any poisons added. 3. Contemplate the introduction of insects that feed on the worm: beetles, green lacewigs, paper wasps and braconid wasps. 4. Further consider the application of a chemical: Bacillus Thuringiensis (aka Bt). This is a natural bacteria that needs to be applied on the top and underside of the leaves. It is poison to the worm which kills them when they eat it. 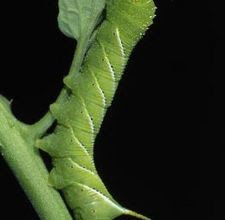 An organic product called Green StepTM Caterpillar Control (http://www.gardensalive.com/product.asp?pn=8797&sid=100308&eid) works great on tomato worms because it contains Bt. An effective all natural liquid concentrate that paralyzes caterpillars resulting in their death from starvation. You will notice crop damage to cease almost immediately. Green Step Caterpillar Control only affects targeted insects. Apply Green Step to the top and bottom of tomato plant foliage at the first sight of tomato worm damage. Then they suggest reapplying every 5-7 days. This is another highly effective way of controlling tomato worms. Till soil in the fall and spring. Wrap toilet paper rolls around the tomato stem at the ground. Place a layer of wax paper around the tomato plant that is 3 inches below the surface of the ground. June should be full of large green tomatoes on your tomato plants. They will soon ripen and play out as we head in to July. Therefore, if we do a little planning and planting now in June, we will have vine ripened homegrown tomatoes up until the first frost in October. Late season tomatoes, aka Fall tomatoes, are usually more sweet and tender. We planted some of our Organic Mortgage Lifter tomato plants on June 15th. Now is the time, with the first of July being the end of the time, to plant the wave of late summer and fall producers in Middle Georgia. We knowingly choose a soil challenged area of our garden to test some tomato care principles. Your date for the last planting in your area should be determined by the date of the first frost. Refer to a First and Last Frost Table and calculate back according to the day to maturity. We often refer to Victory Seeds Table for our frost information (http://www.victoryseeds.com/frost/ga.html). WATERING: We stood a 28" piece of 1-1/4" PVC pipe with 1/8" holes spaced 1" apart for the bottom 12" of the pipe in a hole about 18" deep. This will insure deep watering takes place during the hot Georgia summer. MULCH: After digging the hole that measured approximately 6" by 18", we place a tablespoon of organic gypsum in the bottom of the hole and covered it with at least 2" of organic compost. The amount of compost depends on the height of the tomato plant to be planted. The remainder of the hole was filled with compost, composted horse manure and top soil. this gives the tomato plant a 6" diameter by 18" deep hole filled with composted material and a bottom or deep watering source. We will experiment with the amount of water and the frequency using the deep watering PVC device. The PVC also provides nice initial plant support. We will cover more of this late summer tomato planting wave as we progress to insure the fruit ripens and is harvested before the first frost. 'First frost,' what a cooling thought on these Summer days of 90 plus degrees. Rolled tomato leaves can be caused by several things. Many serious tomato diseases, including curly top, mosaic, fusarium and herbicide injury, begin with rolling leaves. But if your plants are green and no other symptoms appear, it’s probably plain old “tomato leaf roll”. It’s a temporary disorder resulting from excessively wet soil, especially after heavy rains, or bright sunshine on young plants. It doesn’t affect the plant’s growth. A normal crop of fruit is usually produced. The rolling typically disappears in a few days when the soil dries out. ‘Big Boy’, ‘Floramerica’ and ‘Beefsteak’ are affected most often. - Walter Reeves (http://www.walterreeves.com/gardening-q-and-a/tomato-leaf-roll/). Curling or rolling of tomato leaves can be caused by various factors including environmental stresses, viral infection and herbicide damage. To determine which factor is the culprit, it pays to take a close look at the plant(s). Which leaves are rolling – old leaves, new leaves, all leaves? What direction do the leaves roll – upward or downward? Are any other parts of the plant, including fruit, exhibiting symptoms? Physiological Leaf Roll: Excessive moisture and nitrogen, heat, drought, severe pruning, root damage and transplant shock are some of the environmental factors that can cause physiological leaf roll in tomatoes. Initial symptoms are usually apparent in the lower leaves with an upward cupping of leaflets followed by an inward lengthwise rolling of the leaflets toward the mid-vein. The affected leaves tend to become thickened and have a leathery texture, but retain a normal, healthy green color. Over time all of the leaves on the plant may be affected. Interestingly, vine tomato (indeterminate) varieties tend to exhibit physiological leaf roll more often than bush tomato (determinate) varieties. While this condition can occur at any time of the growing season, it usually occurs as spring weather shifts to summer. The good news is that the condition has minimal impact on tomato fruit production and plant growth. By properly hardening off tomato seedlings before planting in the garden, maintaining a consistent moisture level in the soil, and avoiding over fertilization, excessive pruning and root damage during cultivation, one can go a long way toward preventing tomato plants from developing this physiological problem. Viral Infections: Some viral infections also cause leaf rolling in tomatoes. When tomato plants are infected with tomato yellow leaf curl virus (transmitted by whiteflies), new leaves become cupped and pale green in color. In addition the entire plant may exhibit stunted growth, yellowing leaf edges, purplish veins on the undersides of leaves and decline of fruit production. 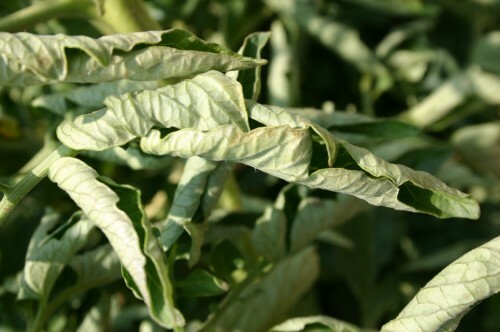 A second virus, tomato mosaic virus, causes rolling of leaves, but other symptoms, including mottled-coloring of leaves, small leaflets and internal browning of infected fruit, distinguish it from physiological or herbicide-induced leaf roll. There is no treatment for virus-infected plants. Removal and destruction of plants is recommended. Since weeds often act as hosts to the viruses, controlling weeds around the garden can reduce virus transmission by insects. As some viruses are transmitted mechanically on garden tools, it also helps to disinfect tools that have come into contact with diseased plants. 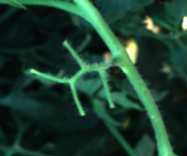 Herbicide Damage: When tomato plants are exposed to the herbicide, 2,4-D, typical symptoms include downward rolling of leaves and twisted growth. In addition, stems may turn white and split; fruit may be deformed. Depending on the level of exposure, the plant may or may not survive. Leaf roll isn't a disease that will spread from plant-to-plant, but it is what is referred to as a physiological disease. The condition has been common statewide and is more likely to happen in either very wet seasons or during periods of extended dryness. Since the latter weather conditions have predominated in most areas of the state in recent weeks, leaf roll is probably tied in with dry soils. And as a result, tomato plants are showing an upward rolling of the leaflets of the older leaves. At first, this rolling gives the leaflet a cupped appearance and it continues until the margins of the leaflets touch or even overlap each other. The rolled leaves are firm and leathery to the touch. One half to three-fourths of the foliage may be affected. The growth of the leaf roll tomato plants is not noticeably checked and a normal crop if fruit is generally produced. In most cases, leaf roll occurs in combination with dry soils and when tomato plants are pruned severely. Also, leaf roll may occur following deep, close cultivation. Some varieties are more sensitive to leaf roll than others, but none are completely resistant to this problem. The symptoms on tomatoes are very similar to those of a virus disease of potatoes that is known as leaf roll, but the leaf roll of tomatoes is not caused by virus infection. Plant tomatoes in a well-drained soil. Fertilize according to soil test recommendations and do not over fertilize, particularly with nitrogen containing fertilizers. Avoid deep and close cultivation especially in dry weather. Maintain uniform soil moisture through irrigation, supplying an inch of water per week. Mulch tomatoes with plastic or organic material. Blossom drop can be attributed to several causes, most often related to either temperature and / or stress. 1. Tomatoes grow best if daytime temperatures range between 70 F / 21 C and 85 F / 29 C. While tomato plants can tolerate more extreme temperatures for short periods, several days or nights with temps outside the ideal range will cause the plant to abort fruit set and focus on survival. 2. 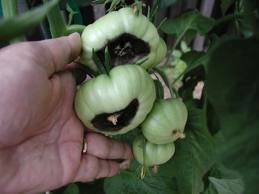 Ensure Pollination Tomatoes need some help to pollinate. Either insects, wind or hand shaking of the flowers is necessary to carry the pollen from the anthers to the stigma. During weather extremes, there are often no insect pollinators in the garden. It sometimes help attract more bees if you plant nectar rich flowers in your vegetable garden. 3. Go Easy on the Fertilizer Don't automatically feed your tomato plants every week. Make sure your soil is healthy, with adequate organic matter. Apply a balanced fertilizer at planting and again when fruit forms. Too much nitrogen encourages the plant to grow more foliage, not more fruit. 4. Work Around the Humidity The ideal humidity range is between 40 - 70%. If humidity is either too high or too low, it interferes with the release of pollen and with pollen's ability to stick to the stigma. So pollination will not occur. If humidity is too low, hose the foliage during the day. This will both cool the plant and raise the humidity. This is not recommended in areas with high humidity or when fungus diseases are present. Gardeners in high humidity areas should look for tomato varieties that aren't bothered by humidity. 5. Water deeply, once a week, during dry weather. Tomatoes have very deep roots, sometimes going down into the soil up to 5 feet. Shallow watering will stress and weaken the plants. 6. Keep your tomato plants healthy. Use good cultural practices and treat for disease as soon as symptoms appear. 7. Sometimes the problem is just too much of a good thing. When a tomato plant has too many blossoms, the resulting fruits are all competing for the limited food supplied by the plant. Only the strong will survive. The plant will automatically abort some flowers. Once the initial crop is harvested, the problem should subside. Blossom End Rot can occur in almost any vegetable. Peppers, watermelons, zucchini, cucumber, carrots and tomatoes to name a few. While each type of vegetable has its own specific cause and remedy, tomatoes will be our focus here. Blossom End Rot in a ripened tomato. YUK! It is all about the water and a little to do with Calcium and timing. Over watering. Too much water washes the nutrients out of the soil and harbors fungus. Irregular watering. Consistency is far more important than quantity of water. Watering during the hottest time of the day. Morning the best time to water. Planting too soon in the season. Tomatoes like the soil to be at least 50 degrees F.
Insure amply supply of calcium in the soil (Eggshells and Gypsum). Till 'calcium' into soil before planting, then topically apply after fruit blossoms appear. Pluck affected fruit IMMEDIATELY when Blossom End Rot is detected. Want to double your tomato harvest? The number one thing you can do is to prune your tomato plants. Pruning is not a foreign concept to most gardeners, but pruning tomato plants, especially in the South, may be a forgotten benefit. The benefits of pruning are: 1. Stimulates growth, 2. Increases airflow which decreases mold, 3. Allows water and nutrients to flow more effectively to the tomatoes instead of the leaves, 4. Tomatoes are healthier, 5. Tomatoes will mature quicker. Today we located a flowering branch on the plant. If the plant has more than one then we considered the lowest flowering branch. We then pruned all leaf branches below the lowest flowering branch. Some tomato growers continue to prune all leaf branches below future developing flower branches. Thereby only leaving leaf branches at the top of the plant. Be careful not to over prune in the South. In the South there needs to be much care to not over prune tomatoes. Over pruning will result in sun scorched tomatoes. Some leaf branches need to be left to provide some shade. Locate the flower or fruit branch(es). As you will notice, the flowering branches are a smaller diameter than the leaf branches. Consider that as you contemplate whether you would like to grow leaves or tomatoes. Locate the leaf branches. Prune off the lowest leaf branch that is below the lowest fruit or flower branch. I am pointing to that branch. Continue pruning off all leaf branches below the lowest flower branch. Prune by pinching off, with a razor blade or pruning snips. This is a finished initial pruned tomato plant. This is what your pruned tomato plant should look like. All leaf branches on the main stem are remove. However, this is not the end of your pruning for the season. As the plant grows, it will need supporting via cages, staking, string, etc. The further pruning of leaf branches, especially those that drape near the ground, will need to be done. Removal of these low draping leaves will increase air circulation which will greatly help to prevent fungus and blossom end rot. Remember this is the primary pruning and others will be necessary as the plant grows. Remember, in the South, a balance between leaf branches for shade should be attained. Do not remove all of the leaf branches. Down the Lane Creatives is a Lane Family Enterprise focused on quality products and services. We aspire to work as a family to bring fulfillment to your family.